Evaluate your life. Evaluate your holiday parties. Impress your friends and family during the holidays with your drink decor. Show off your knowledge of Purity Vodka and how to dress the vodka itself in Orrefors crystal glasses. Show them why these two are the perfect pair and why glasses matter. I love vodka and I also begin to love to taste it on its own. I start to understand it better with the knowledge how it is made and why it is sometimes best on the rock or neat. I usually squeeze a wedge of lime to enhance its flavour because a little does go a long way. No matters what type drinks you'd make with Purity Vodka, it will look beautiful with any lights dressed in Orrefors crystal glasses. Try it out by visiting the links provided. Also, enter my giveaway on my Instagram page for a chance to win your own set of Orrefors glasses. Who needs canvas, suede, or even leather shoes when you can wear ones made out of merino wool? Soft, lightweight, and breathable, that’s what Allbirds Runners are designed to be. Straight from New Zealand, “The Land of Sheeps”, comes Allbirds Runners. Designed to keep you comfortable through every step and every movement. Starting from an idea, to a Kickstarter, to the actual runner, Allbirds has come a long way. Its commitment to being eco-friendly and striving to always improve is what makes them successful. From being ZQ-Certified, a part of B Corporation, partnering with Soles4Souls, and using less materials in their products, Allbirds always has the environment and the people first. Everything about the shoe, from the wool upper to the foam and rubber soles, will make you appreciate the craftsmanship. No matter what season it is, these runners are perfect for any occasion. From chilly winter nights to scorching summer days, the Italian knitted merino wool is breathable and flexible. Which means that when it’s warm it keeps your feet cool and when it’s cold it keeps them nice and toasty. They’re also moisture wicking and dirt resistant so they’re clean and built to last. To add to this, they’re so soft that they can be worn without socks - no need to worry about stinky feet either. Having such a simple design also makes Allbird’s Runners such an amazing shoe. There’s minimal branding and the wool upper is a solid color. Like the seasons, these runners can thrown on with any outfit. Quick errands around town or even a night out with some friends. No matter the situation or the outfit, these simple shoes can be thrown on without a second thought. #OOTD & #KOTD material for sure. No one really looks forward to Monday, that is if your Monday is a getaway to Palm Springs with the new 2017 Chevrolet Cruze Hatch. Then, yes, bring it on! 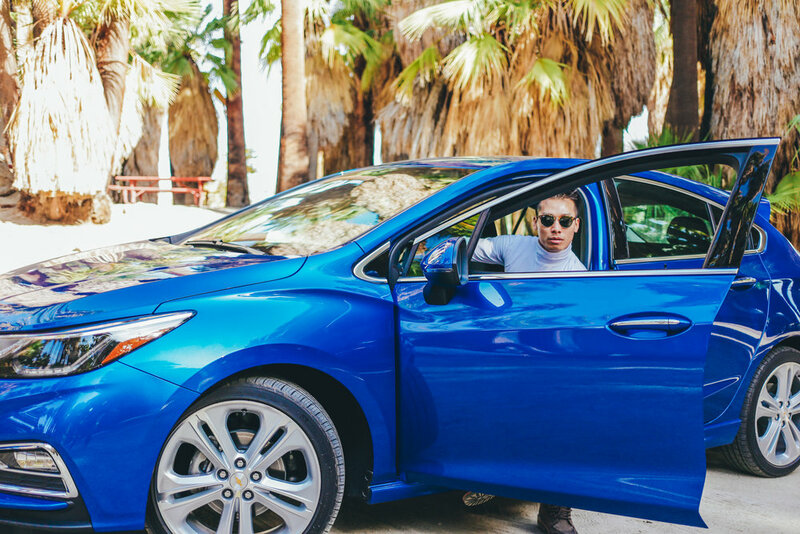 I recently had the privilege of driving the new 2017 Chevrolet Cruze Hatch on a getaway to Palm Springs. I have been living in California without a car for a few months now. I have been itching to get my hands on the wheel. What a better excuse to get away from the city, than with an amazing car and some of the best group of friends. Nowadays, to get anywhere you need a great buddy with an amazing sense of direction. I am glad the new Cruze has 4G LTE with Wi-Fi hotspot installed to help me avoid California traffic as much as possible. The ride to Palm Springs from my place in Los Angeles only took under 3 hours with LA traffic and that is not bad at all. With all the amazing features the new Cruze Hatch has; Lane Keep Assist, Rear Cross Traffic Alert, Side Blind Zone Alert and Rear Park Assist. I felt very comfortable and safe on the highway while jamming to an amazing playlist connected onto the Cruze. The extra hour in the car ride was needed as I did not want to reach my destination without testing everything this car can do! The car is comfortable with extra leg room for the driver and passengers. The Cruze Hatch is smooth and so zippy! I love the speed that it gives. It can be a sports car when it needs to be. As I arrive at my destination, getting around Palm Springs was a breeze. With the Chevrolet MyLink, it organises and integrates my technology so I can enjoy every ride smoothly and quickly. The Cruze Hatch can definitely handle any bumpy road and tight spaces as I made my way to the Indian Canyons for my first hiking experience....ever. My experience with the 2017 Chevrolet Cruze Hatch has been amazing. It gets me to my destinations on time and safe. This car is so convenience and practically for me to driving around California and it's infamous traffic. Behind every photographer is a great camera. But behind every blogger is a powerful laptop that can do it all. It has been over a month since having the HP Spectre laptop and I cannot express how much this laptop has enhanced my daily life. I can say I am obsessed with it. Being an entrepreneur in the creative industry you will never know what kind of job you will get. Being quick and alert is the best way to get those jobs. Working for myself requires me to be on my laptop at all time if I want to keep getting jobs and keep my clients happy. That is why I always travel with my Spectre because it is so thin and I can just work from anywhere I need to be. Travelling with the Spectre has been amazing. Most of the time I forgot that I have it with me because it is so light! I am always on the Spectre putting together mood boards for projects, pinning outfits on my Pinterest, finding inspiration, scouting locations, drafting up my next blog post, and editing photos. I can easily do it all on the Spectre. But most importantly, the Spectre has challenged me to go outside my comfort zone and be more creative. It acts as my creative outlet by giving me tools I need to do. I hope that when you get your Spectre laptop, it will give you the creative push you hope for and help you reshape and reinvent yourself with each click. * Blog post sponsored by HP. Your weekend getaway just got a bit more easier and less stressful. Swissgear suitcases and bags is the best product to hold all your gears safely in one place. As a constant traveler, one of the main things for me when choosing the right suitcase is how efficient it is. I hate waiting for my luggage at the baggage claim as it can take forever. I am a land and go kind of guy as my trip are usually short. I love my Swissgear 6150 Hardside Spinner carry on. It is light and I can pack so many clothes into it for carry on. The "Spinner" carry on offers liteweight durability with unsurpassed maneuverability. Finding the right backpack to carry my laptop and camera while keeping it secured as I move around the city can be difficult. Often times I have to sacrifice quality for function and style for comfort. Finding the right bag to keep all your important tech products clean, organized and protected so you never have to slow down or worry is a rare thing. Once you find that right bag...don't ever let it go! The Swissgear ScanSmart TSA Laptop Backpack collection checks all of the requirements for me. One of the features I love about this backpack is the ability to breeze through airport security while keeping your computer secured in its compartment padded with high density foam. No more wasting time at the security taking out and putting my laptop back in. Days into receiving my HP Spectre and playing around with the functions. I was blown away by how easy it makes transitioning from blogging to editing photos with just a touch. This laptop is not just known for it's beauty, but the fact that it packs quite a powerful hard drive to handle all my applications. With its unique and striking look, the Spectre is the talk of the town as it turn heads when you pull it out at the office or coffee shop. It is extremely thin and light, which makes it easier for me to carry it around and not feel like I am carrying a brick walking places to places. Its fast performance and pleasing display helps me edit photos that I know are going to come out beautiful. Never have I had a laptop that tested my creativity and helps me improve it. With unlimited applications and features that are in this laptop I can never lose my inspiration. Traveling with the Spectre, I turn every coffee shop into my personal office just by how I get lost into it. Even when I thought I knew everything there is to what the Spectre can do, it always surprises me to when I am playing around with it. I recommend this laptop to all the creative spirits out there! A great investment for your back to school essentials. Imagine the world's thinnest laptop; actually nevermind, you do not have to imagine it because it is already here. HP just launched their new HP Spectre laptop. The Spectre's most noteworthy feature is that it's the world's thinnest full-power laptop, at just 10.4mm thick. Since I do a lot of coffee hopping through-out the day, I do need something that I don't feel like it is a hassle to carry around. It is way lighter than any textbook that I carried in college. That is a fact. One of the things that caught my eyes when I opened the box was the bold color scheme of the Sprectre. It helps the Spectre stand out a lot to me. HP ditched the usual silver and gray for a dark, smokey gray with gold accents. The entire hinge is a bright, jeweled gold, which just draws more attention to its unusual design (and which picks up fingerprints pretty easily). Another great feature of the Spectre is that it can multitask between many apps effortlessly. You can run through Word documents and Excel spreadsheets without an issue, and can even handle image editing in Photoshop without really breaking a sweat. Trust me, a lot of laptop would freeze or shut down when handling to many things at once. I have many stories about that, but that is for another time and another blog post. The Spectre is not a gaming machine, which is okay, because it is not designed to be, but it’s more than powerful enough for productivity work. I love a laptop that can keep up with me and my weird ability to multitask ten things at once (and not freak out). Being in the blogging industry means you have to multitask easily and be a jack of all trades if you want to do well. Follow me on my journey with HP as I master how to use this amazing laptop for work, blogging, editing photos, and among other things. To think outside the box is to go against the norm and that is what this new watch brand did. Great George is a different kind of watch brand that is on its own lane. Born and created in New York City by two friends. Great George offers square watches made with quality materials at an obtainable price. Fashionable watches oftens look "loud" with excessive decoration all over of the usual circle frame. The creators behind Great George wanted to make a change from circle to square face. They want to create a square watch with a timeless design at an obtainable price. Thus, that is how Great George is born. To read more of the story behind the brand click here. This Fall, I partnered up with Calvin Klein to bring you their newest collection called the "Calvin Klein Jeans Black Series Limited Edition". It is an exclusive capsule collection of neoprene urban streetwear featuring joggers, tees, & sweatshirts with the iconic CK logo. The new collection, designed by Calvin Klein Jeans Global Creative Director Kevin Carrigan, consists of bomber jackets, tees, sweatshirts, and sweatpants for men and women. This collection is geared toward the demographic of Calvin Klein that are into streetwear a the brand is working to appeal to the younger audience. All pieces are constructed with tonal black neoprene that features new heat-sealed technology. Perfect for the cold weather ahead of us. Neoprene is synthetic rubbers that are produced by polymerization of chloroprene. Neoprene exhibits good chemical stability and maintains flexibility over a wide temperature range. It is used in a wide variety of applications, such as laptop sleeves, orthopedic braces (wrist, knee, etc. ), electrical insulation, liquid and sheet applied elastomeric membranes or flashings, and dry suits. The Calvin Klein Jeans Black Series Collection is now available online for purchase here. In this post, I am sporting the Spacer Oversize Sweater. This collection effortlessly stylish and easy to wear on a daily basis. A perfect outfit isn't perfect without a belt that brings it all together. Upton Belts is not just any belt. It is a belt with a story behind it. Made in Texas, this belts bring an experience that you would never imagine. Making you feel unique as the belt is made to only fit your waist. Although each Upton Belts is specially handmade in Texas from American-sourced leather that has been tanned in Italy. One of the special thing about this brand is the fact that each Upton Belts is handmade in Texas from American-sourced leather that has been tanned in Italy. Each belts is individually numbered and custom-sized for you. Another great thing to make sure that your belt is personalize is that the brand created their own alphabet to have your initials stamped on inside the belt. Their focus on superior materials and meticulous craftsmanship ensures that each Upton belt is a unique creation. In other words, they care about details because they know that as customers you want the best and finest there is. Read more about the story behind the belt here. Upton Belts comes with 3 different collections; Dress, Casual, and Sport. So you can dress them for any style and occasion. You can shop the full collection online here. Iconic shoes brand. Clarks, known for its Original Desert Boots has branch out to it's newest demographic of the sneakerheads. Introducing their newest collection of sneakers called "Trigenic Flex". The collection comes in 3 colors of Black Nubuck, Midnight Suede, and Rust Suede. Growing up I have always been a huge fan of the brand as it has made many collaborations with streetwear brands such as, Supreme and Staple. Now, they are working on their own sneaker collection that is soon to become a classic much like their Originals. They are changing the game of footwear with these futuristic designs of the sneaker. As someone who lives in New York City, I am always on my feet. Whenever I look into getting new sneakers I always go for comfort first, then style as I do not want to be in pain all day. These Trigenic Flex have an amazing look and is comfortable to wear. The materials used to making the sneakers is very light and breathable for my feet with each steps. I am able to walk and jump in them comfortably as you can see from the photos! A few months ago I was pondering on where to find some affordable "harry potter" glasses. I was watching a Korean drama and one of the character in the drama, a doctor, was wearing a circular prescription glasses. Those glasses looked awesome on him and I thought that it would look great on me too. Since then I've begin my search to find the perfect circular glasses and found upon Firmoo, an global online optical store. Firmoo offer varieties of prescription eyewear to the consuming public in high quality yet at extremely affordable prices. Back when I started wearing glasses in the middle school, glasses were anything but fashionable. I was actually ashamed of wearing my dorky glasses that my mother got me. I remember only wearing them when I only needed them. Today there are so many different options to fit every person and every lifestyle. And no need to make any trips to the doctor when losing or breaking another pair of glasses. You can just order them online now. How convenience is that? After about an hour on the site because I was indecisive about which pairs to get (they have a wide varieties of shape, color, size, and style). I finally made my choice and went with a round glasses in matte black ( Style #F1018) because I wanted a pair that would be my every essentials that goes with my style. I received my first pair of presciption glasses from Firmoo in just 2 days! The glasses came with a nice case, spectacle pouch, cleaning cloth and tiny screwdriver. The quality and form of the glasses is amazing. It's so light to wear. I don't feel like I'm wearing 2-3 pound of weight on my wears. Also, it comes with a screwdriver so you can adjust it when it gets loose. More importantly, Firmoo is aware of the aesthetic functionality of eyeglasses. Though long being an integral part of the fashion industry, eyeglasses are never consumed in the same manner as other fashion items with the expensive price being the major hurdle. Firmoo.com makes the fashion-conscious consumers’ dream of creating a real eyewear wardrobe a reality. At such an affordable price ($39), I suggest you get on to their site and order a pair or two! “Welcome to the family”, is what I said to myself when I first received this watch. It was like a rite of passage to a secret society where only a chosen few are welcomed. How could such a clean watch hold so much class and be such a timeless beauty at the same time? Truly a one of a kind, beginning with its iconic logo of a backward “D” and a “W” you immediately recognize it is a Daniel Wellington watch. Straight out of Sweden making its way around America, the watches come in silver or rose gold to fit any mood and outfit. It comes with interchangeable straps (leather or NATO); you can go from casual to formal in just seconds. With its preppy look, the Daniel Wellington watch is slim; I concur with their depiction in that it is rich and would be suitable for each and any event. A watch that is so lightweight, you barely even notice that you are wearing it. But, the one thing that every watch ought to do is tell time precisely and this watch has flawless timekeeping. At this price ($135-$229), it's one of the smartest solutions to sharp sophistication out there this summer. I would consider it one of the best investments I have ever made as it is easily incorporated with any of my outfits, style, and flatlay photo-shoots. Are you ready to be part of the Daniel Wellington family? Visit their site at www.danielwellington.com to shop their full collection. 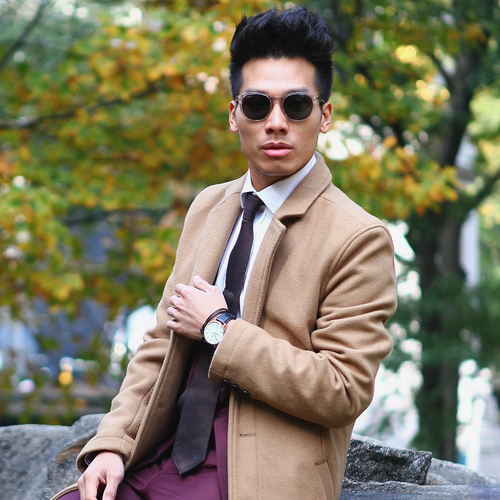 Enter my free Daniel Wellington giveaway here. Lacoste Eau De Lacoste L.12.12 Rouge Cologne by Lacoste. The collection takes inspiration from one of the world’s most iconic pieces of clothing. The LACOSTE L.12.12 shirt. This fragrance was released in 2011 . This is the fourth edition in the l.12.12 series of colognes. Rouge or red as it is also known is a robust fragrance with some unusual notes. There is nothing common about this scent. A warm and spicy scent that is confident and rewarding. The top notes are tangerine liqueur, mango and rooibos tea. The heart notes are ginger, cardamom and black pepper. And the bottom notes are acacia wood and benzoin. EAU DE LACOSTE L.12.12 Rouge EDT 100mL/$65 EDT 30mL $41. Available at department stores including Bloomingdale’s, Macy’s, Dillard’s, and specialty stores such asLACOSTE, Sephora, and Ulta. Teamed up Dharma Eyewear to help spread vision awareness . prevention of blindness and impaired vision due to uncorrected refractive error. Simply, the need for an eye exam and a pair of glasses. because they do not have access to the eye examination and glasses they need. "Dharma", or responsibility, is central to our mission. That's why, for each purchase, Dharma will donate 5% of each sale to Optometry Giving Sight. They help provide glasses and eye exams to those who can't afford it. With a great bag comes big responsibility and that’s why iCarryAlls is best at it. The bag that is able to hold all of your business essentials. From pens, business cards, portfolio, laptop, tablet devices, and etc…anything you can think of it will be able to hold it all. This bag can truly carry all. A name that is well given to what the product can do. As a blogger, I am constantly on my electronic devices. Whether I am commenting on a post, answering emails, or making a post entry I need my laptop and other essentials with me. I want a bag that is made to hold my laptop, ipad, pens, business cards, and notepad. I do not want to just toss that all into a backpack and let it be all unorganized. I want a bag that can perfect hold all of that in place and organize. iCarryAlls by XIAOZHI is able to cater that to me. The bag is customized to what I need and is fashionable for me to wear it anywhere I need to go. Each bags is made of luxury and customized leather in sophisticated travel bags handbags, briefcases, should bags, and cases for electronic devices. One thing I love about the product is that you are able to customize a bag that is able to fit you and your profession. They have the right thing to fit their customer individual needs. Visit their site at www.iCarryAlls.com to view their wide range of products or to request your own design. I can promise you that they will have what you need to carry all.